…we never truly stop, our Journey is never complete, because we will continue to flourish – just as when the caterpillar thought the world was Over, it became a Butterfly. 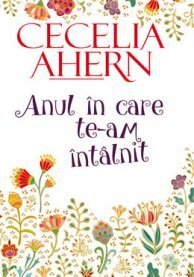 Cecelia Ahern is one of the writers that I’m still discovering. Her books are life lessons hidden behind stories in which we find ourselves. We resonate with them and they surprise us. ‘The Year I Met You’ surprised me. I expected it to be great form the beginning – a sweet love story meant to be praised from the first pages. But no. With every page, I was discovering a character that I would have slapped again and again. At the same time, I felt like looking into a mirror, and it was grinning at me – not a pleasant sensation! So, for the first dozen pages I hated the main character. In fact, I found her a superficial person. However, I loved the introduction. “I was five years old when I learned that I was going to die” – this is the first line. Then, the next chapter comes like a slap, for me at least, since I’m pretty familiar with that situation: “‘I’m done with my job. I got fired’, said Jasmine.” This is the point where the character’s evolution starts. It took me about a hundred pages to resonate with Cecelia’s story. It’s a lot, indeed. If it wasn’t for the author, I might have put the book aside and forgotten about it. But that wouldn’t have been a wise decision. The story is written in such a way that it keeps you there, in the moment. You want to know what will happen that year and how the relationship will evolve. The more you read, the more surprised you get. Jasmine is haunted by her childhood discovery – that she is going to die. She works tirelessly to give meaning to her life. She is a typical example of a workaholic, she doesn’t take sick days, she doesn’t complain, and continues to push herself. When she is fired and forced to take her ‘gardening leave’ from work she feels punished. For an active person like her, staying home is a nightmare. She is one step away from depression. For her, this year will be the year of healing, the year she’ll discover the meaning of life. Jasmine will discover herself, and she will see for the first time the beauty around her – the small things that we are also used to ignore. I didn’t say anything about HIM. Well, there’s also a guy, but not the one that I expected. The book is full of surprises, I’ve told you! 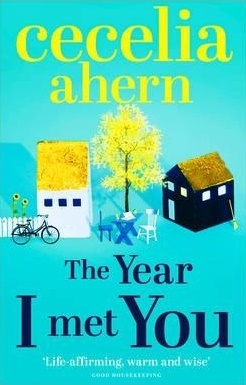 Throughout the four seasons we’ll discover the evolution of the character, the lovely garden that blooms along with Jasmines’ feelings, and we’ll receive a new lesson from Cecelia Ahern. A beautiful one! When we feel like we’re on the brink, when we have only dark thoughts, that’s when we’ll take a new step on our journey. After that, we’ll look back, and we will smile. I recommend you ‘The Year I Met You’. It is the kind of book that stays with you long after you read it, that helps you find some answers or, better yet, it helps you find out the right questions.